It took me a long time to finally paint my fireplace, and then I took ages trying to decide what should go up on the mantel. Finally I realized that I wasn’t happy with anything I put up there because I with the bookshelves on either side (shown here), it just seemed like there was already so much on that wall. 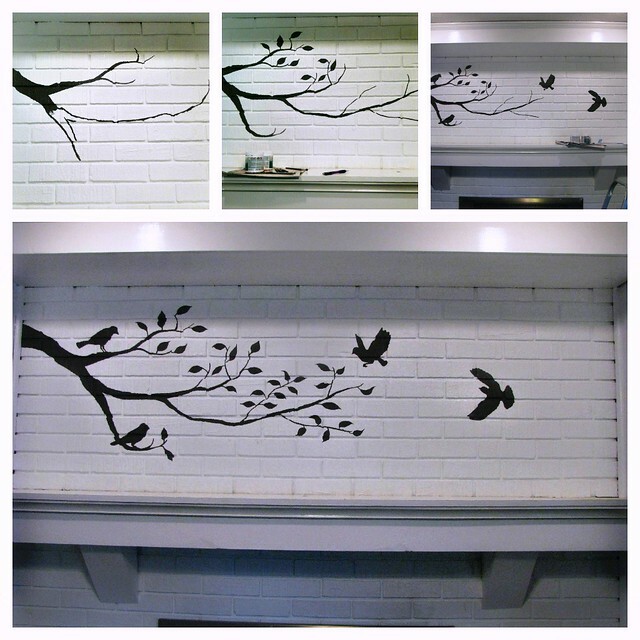 I thought about buying a stencil to add a branch and some birds, but with the depth changes between the brick and the mortar, I’d have had to trace it first and then paint it in my hand anyway to get it to look right. And when I realized a stencil would run about $50 once I paid for shipping … well, NO. So why not just try painting it out by hand in the first place? (If it was awful, I could always just paint over it, right?) I ended up with this, and I think it will do. Maybe I’ll add some low candles to the right, if anything at all. Total cost: A tester pot of Martha Stewart’s paint in Seal, about $2.50, and a set of paintbrushes from the kids’ art aisle for 99 cents. WAY better than $50! cute! and I think candles would be the perfect little touch! Thanks, Jennie! :) I’m trying out three tea light candles in short, chunky red glass holders, and I think they might be just right. I love it, Sarah! The candles sound nice and simple. Perfect! Thanks, Erin! Funny how one change leads to another — I’ve replaced the lampshades now, too. Wonder what’s next?